Silk Skirt - vintage, Tank and Necklace - Forever 21, Leather Jacket - Zara, Shoes - from Crossroads Trading Co. This maxi skirt is one of my latest vintage finds, the result of a devoted hunt for all things long in length. So far this one is my favorite. It's silky texture, eclectic and worldly print, and striking color combination make for one completely delicious package. I don't think I have been drawn to a piece of clothing in my closet as much as to this one. Let's just call it a serious love affair. I even wore it the day I bought it, putting it on right after a grueling hike. I couldn't help myself. I happened to have on a striped shirt that day, but it worked perfectly with the pattern on this skirt. I got compliments all day. Not that I needed any compliments to realize the beauty that this skirt conveys. I already knew it the moment I spotted it on the rack. Now I am off to enjoy the weekend. This week has been toooooo long. Thank goodness for Fridays, Saturdays, and Sundays! I hope you all enjoy yours, too! nana! thats so pretty maxi skirt! the pattern and the color! The pattern of your skirt is so wonderful! And oooh I'm so happy it's weekend too! What a beautiful skirt! You look amazing! the pattern of your skirt is heavenly. The skirt is indeed pretty. Love that print and love that you paired it with a tough jacket! you look very pretty here dylana! mix between grunge and bohemian. i am in love with everything that is maxi. your skirt is fabulous! i oved your jacket... and the skirt is good too but i'm not into max-skirt!!! You look stunning. I love the print of the skirt. I love that skirt.... the pattern is gorgeous! Great look! You're so good at posing! I love your jacket. You are such a unique beauty! Your outfits inspire me to try things I normally wouldn't. love the patterns and colour of your maxi skirt! wooowwwww nana...you're look is perfect!! great skirt, i love the geometric pattern. Love the skirt! It's a little bit oriental (arabesque?) print, isn't it? I liek your blog and your outfits, of course follow! you look great! this skirt is awesome! I like it! gorgeous skirt! I love it with the leather jacket too. Enjoy the weekend! That is an amazing skirt! What a great find! If I were you, I'd want to wear it all the time, too! I love that skirt! Such a unique print and pretty color! You are stunning. I have never really loved long dresses before.But now I wear them as often possible.So I LOVE this look.Amazing print. i really adore the combination of the jacket and the skirt! i can definitely see why you'd get so many compliments on it. what a great find. happy weekend! The skirt looks great, what a lovely vintage find. Enjoy your weekend! Great combination. I just received my first black faux leather jacket in the mail yesterday and I'm trying to decide if I like it or not. The jacket is my fav. your hair looks phenomenal. and that is a great skirt! Love the leather with the skirt!!! The skirt was such a great find!! I love it- the pattern is really unique and awesome. I love your outfit a ton - you have amazing style! LOVE the pattern of the skirt. such a great find! looks gorgeous on you :). oo and lovely crossroads find, def my faav thrift store. always so chic girl! became a fan on Chictopia <3. Great vintage skirt. Lovely colours. It matches you perfectly. beauuuuutiful maxi skirt. you look fantastic!! love ur maxi skirt, the pattern is so pretty! Stunning outfit! You are so beautiful and have a really good fashion sense. Keep it up and thanks for sharing! wow so pretty vintage skirt!!!! beautiful look! everything looks so good on you! u pull off that skirt so well! it seems like it's a bit hard to pull off but honestly it looks great on u!! be-be-be-beautiful skirt. Adore the pattern plus it looks damn good with that leather jacket. The skirt is adorable! !Love it!! your skirt is so amazing! love it! The print keeps the maxi trend fresh. Great find!! SO SO SO pretty! love it! gahhhhhh what a find!! the print is fabulous! definitely the star of the whole ensemble! just discovered your blog and I´m really impressed and inspired! absolutely gorgeous! 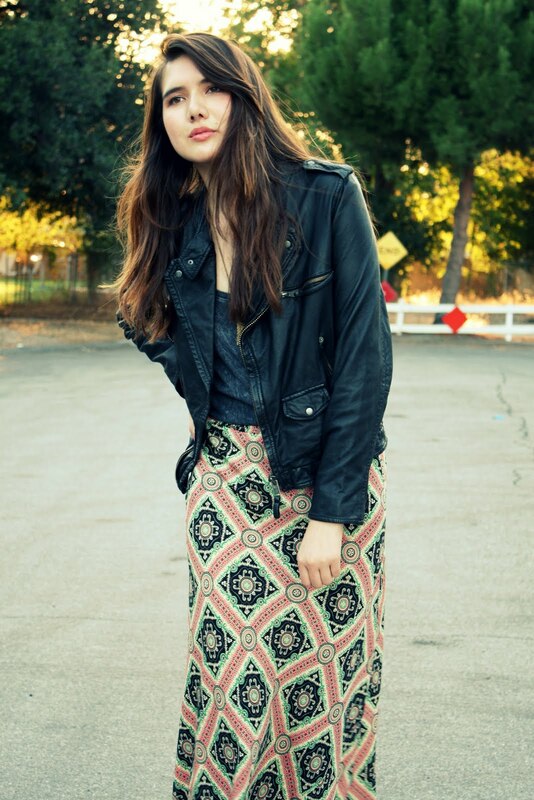 I love that skirt paired with the jacket! For some strange reason I really love the 'pink dust' title! And I agree, there is nothing more satisfying than finding something perfect for you after hours of trawling. I always like wearing silk skirts - they feel so elegant. Oh I adore the skirt and these pictures of you are just soo lovely! ahh i love it; it's so YOU! i saw the pic your sister tweeted of you in this skirt and the striped shirt the day you got it, and it did look amazing together! and gosh your hair always looks so damn perfect. Love that jacket! So cute. beautiful photos, thanks for your comment you have a nice blog! I can totally see why you bought it! you look great with hair and makeup like this. This maxi skirt is one of the latest vintage finds and it result of a devoted hunt for all things long in length. this is one of the favorite skirt for us. It's silky texture, eclectic and worldly print and striking color combination make for one completely delicious package.it worked perfectly with the pattern on this skirt. I hope everyone enjoy this post.